Mr. Hirotoshi Chinen, director of operations for NEXCO Okinawa, recently spoke at the American Chamber of Commerce in Okinawa’s (ACCO) general membership meeting discussing the impact of the consumption tax increase and new discount programs. The consumption tax hike from 5 percent to 8 percent caused a review of all subsidized programs including standard expressway and Electronic Toll Collection (ETC) cardholder fees. 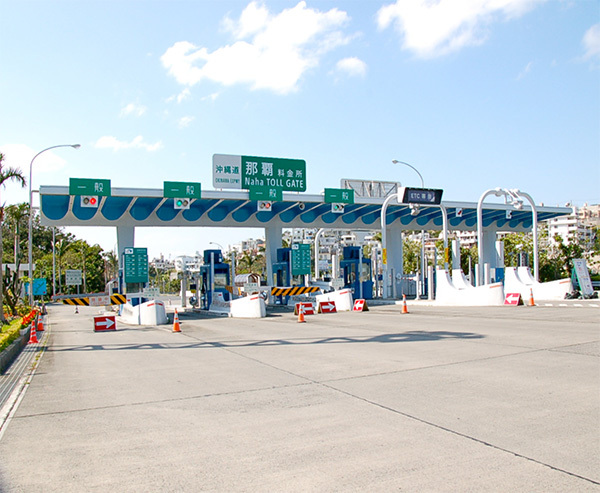 Good news was received by the NEXCO Okinawa office as the central government agreed to continue subsidizing the expressway tolls 35 percent off the “standard” rates until 2017. One of the primary goals for the continued subsidy is to relieve heavy traffic on municipal roads with a mass island-wide transit system unavailable at this time. Mr. Boudreault, an ACCO officer, asked why some of the toll fees were increased and some were not after using the expressway on April 1, 2014. Mr. Chinen informed the attendees that the 3 percent increase in the consumption tax will not result in a flat 3 percent at all toll exits. The formula for the updated toll fees is based on other factors such as the distance between exits, with the total fee rounded to 10 yen. Therefore, some tolls increased while others have actually decreased. Mr. Chinen also took time to brief on the revised discount programs for ETC cardholders. The previously automatic 50 percent discount between 6:00-9:00 and 17:00-20:00 is now based on usage with credit applied in the following month. Cardholders must now use the expressway over 10 times per month for the 50 percent discount to start. A new points program has also been added for cardholders with the following example for the first level: 10,000 yen in toll fees = 1,000 points = 500 yen credit. Cardholders must go online and register to use the points program.